Toyohara Kunichika (1835-1900) A Scene From the Eight Dog Heroes (Hakkenden) from the series Kijsutsu 12 Shi (Magic In the Twelve Signs of the Zodiac), Oban. 1877. This very fine Kunichika is from a series depicting the twelve signs of the zodiac. This one - dog - shows the actor Bando Hikozaburo from the play the Hakkenden or The Eight Dog Heroes. Whilst the portrait of Hikozaburo is splendid, the attraction in this print is the beautiful bokashi background of dogs and foliage, rendered so exquisitely in shades of night greys and misty browns. The ghostly dogs themselves loom out of the evening mist, reminiscent of Walt Disney’s drawings of the 1950’s/60’s, (perhaps the 101 Dalmatians). The Hakkenden story begins with death of Princess Fuse, impregnated by her father’s magical dog and giving birth to eight miraculous balls of light which in turn produce eight sons, all of whom have the syllable inu as part of their surname (in Japanese, inu refers to dog). 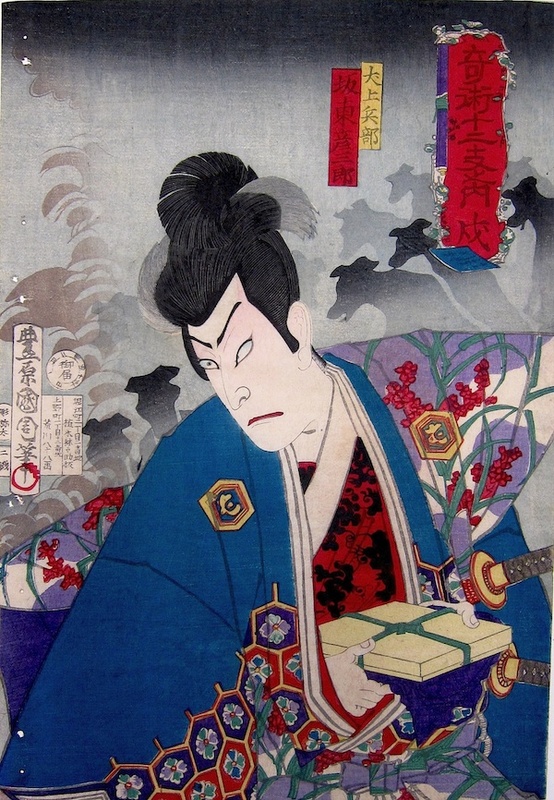 The eight sons reunite during the course of the play as hero samurai seeking revenge and retribution via a complex story that culminates in a dramatic rooftop fight with a gigantic cat for which the kabuki play is famous. This is a lovely piece, an early and crisp edition with very lovely bokashi and strong embossing on the figure of Bando Hikozaburo. Colour and impression are very fine and the condition is excellent. Some album binding holes to the left hand side.